Aral Balkan — npm install -g — ERR! Please try running this command again as root/Administrator. npm install -g — ERR! Please try running this command again as root/Administrator. 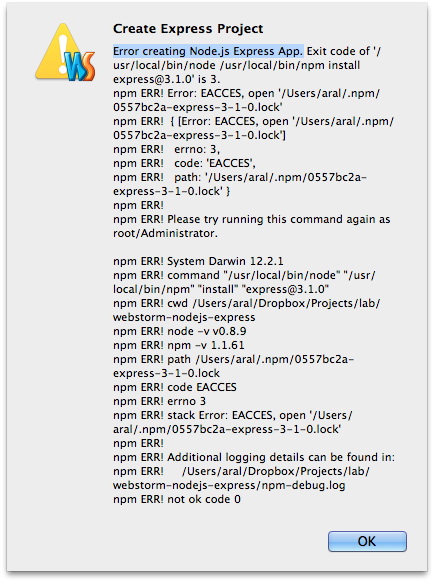 11 February, 2013 When running npm install -g somepackage, you may get an EACCES error asking you to run the command again as root/Administrator. Here’s how to fix this on OS X. Why shouldn’t I use sudo? Read the ‘what, no sudo?’ section in Isaac Schlueter’s introduction to npm. If your permissions are not set correctly, you will also run into this issue if you use the WebStorm or IntelliJ IDEA IDEs from JetBrains (my editor of choice is Sublime Text 2 but I do evaluate other IDEs all the time) when creating a new project based on the Node.js Express App template. I hope the Intellij folks handle this more gracefully in the future (ideally by allowing you to fix the permissions problem from inside the app by entering your password and clicking a button).